For today’s English lesson we’re going to look at transitive and intransitive verbs but before that can you answer this question? What’s the difference between these two sentences? Of course, the meaning is completely different but concentrate on the grammar. How do the sentences differ grammatically? You’ll notice that the first sentence has the words “the bag” after it. The second sentence doesn’t have any words after the verb. How these two sentences differ leads us to discuss two types of verbs: transitive and intransitive. 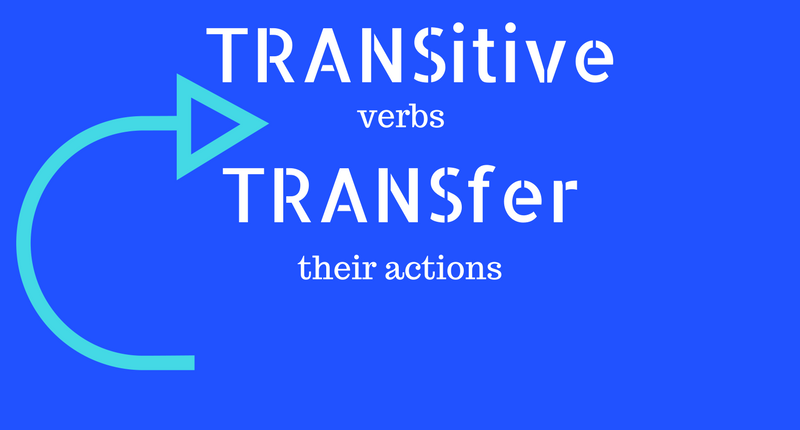 Transitive verbs are actions verbs where an object receives that action. Look again at the sentence above, the direct object “the bag” received the action of the verb “carry”. On its own “I carry” doesn’t make much sense. Transitive verbs need an object to receive the action. A great tip to remember is that transitive verbs transfer the action to the object. As you can see all of the verbs above are transitive because the object receives the action of the verb. Look back again at the first example we used. The second sentence was “The dog barked.” Is it a transitive verb? The answer is no, it’s not. It is an example of an intransitive verb because there is no object to receive the action. In all of the cases above, the subject is doing the action and there is no object to receive it. Is it a transitive or intransitive verb? Think about the rules we have just looked over. Well, even though it has words coming after it, it is still an intransitive verb since there is no direct object receiving the action. The words that come after the verb here “to the shops” form a prepositional phrase. Are there any verbs which are transitive and intransitive? The answer is, yes! Some verbs can take an object after it but don’t always require one. So in one sentence, the verb may be used as a transitive verb and in another sentence, it may be used as an intransitive verb. And there we have it, that’s it for the English lesson today. We hope this has helped you as you will need to know about transitive and intransitive verbs to learn things like the passive form. If you liked this lesson today, don’t forget to let us know in the comments below, we would love to hear from you. Thnx for the great, yet, simple explanation. Are the transitives always need a direct object? And , would you please give us an example of using transitive and intransitive in the passive forms?